A panel discussion will immediately follow the film screening. Please scroll down for a brief biographies from the panelists. To access the film's website, please click here. Donna Roberts, producer/director with multiple credits in the U.S. and Canada, in public and private television. 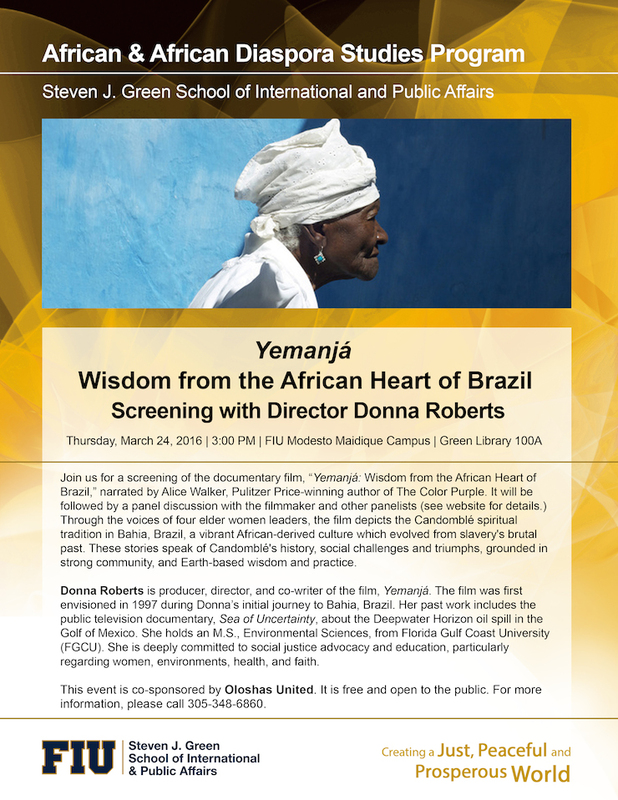 Donna has worked between North America and Brazil since 1997, when she participated in the Rio + 5 Forum on sustainability. Most recently, she produced a dual language documentary for PeaceWoman Brazil (Mulheres pela Paz), about ending domestic violence. Donna directed the Telly Award winning documentary Sea of Uncertainty about the Deepwater Horizon oil spill in the Gulf of Mexico (WGCU Public Media). With an M.S. in Environmental Sciences, her thesis focused on the work of Brazilian women socio-environmental educators/activists, with the goal of adding their voices to the global discourse on environmental education. Tosha Grantham, is a PhD Candidate in art history in the Department of Art History and Archaeology at the University of Maryland, College Park.earned a B.A. in art history from Georgetown University, and an M.A. in art history from Howard University. Grantham’s scholarship focuses on contemporary art with specializations in American and African Diaspora arts and a minor in West and Central African art history. Jeffery M. Gonzalez, a native of Miami, Florida, is an Instructor of Religious Studies at Florida International University. His areas of research include religions of the African Diaspora in Cuban and Trinidad. Andrea Queeley, Associate Professor of Anthropology and and Graduate Program Director of African & African Diaspora Studies. Her areas of research include Caribbean Migration, Cuba, African Diaspora, Race, Social Inequality, Black Popular Culture, and Anthropological Fieldwork. Miguel “Willie” Ramos, Obá Oriaté Lukumí (master of ceremonies for ordinations), olorisha ordained to Shangó, was born in Havana, Cuba. He was ordained into Lukumí religion when he was thirteen and has been an Obá Oriaté for over thirty years. Ramos studies Lukumí/Yoruba religion in Cuba and Brazil. He holds a PhD in History from Florida International University where he has taught courses on anthropology, sociology, and history. Albert Wuaku, Associate Professor of Religious Studies and Undergraduate Program Director for Summer. His areas of research include African and Caribbean Religions, Fieldwork in Religious Studies, Religion and Culture.